Travel from Saskatoon to Brabant Lake (km 172). We dropped off our gear and drove to Southend (km 220) where we left our vehicles and got ferried back to Brabant Lake. There is a nice boat launch on Brabant Lake right across from the gas station. We however, elected to follow the trip notes and went past the Brabant Lake gas station, across the Waddy River bridge, and down to the shore of the lake. There is a hill right by the launch point that has good camping spots. We stayed there the first night. Although there was garbage strewn about, and we could hear some of the locals, we did not have any problems. Alternately, there are two islands just off shore, both with spots that would be suitable to camp for the night. If you are worried about running into people, then I would suggest camping on one of the islands. *** While at Southend, we were informed by SERM that due to heavy rainfall in the north, the Whitesand Dam was releasing a lot of water into the Reindeer River (which must be paddled upstream on this trip), and to expect heavy current and high water levels, as well as unpredictable water at the base of the Dam. The first day of paddling! We paddled from Brabant Lake, and spent the night on the south end of Lavender Lake (location 893070). The water levels on this section of the trip were low, due to the time of year. Much of the first day we observed burnt forest, and little wildlife. We ran the first section of fast water that ran through narrow channels and formed tight s-curves. Following that, we lined the rapids marked as “Lavender Rapids” on the map. We started off the day looking for the purple sand of Lavender Lake in the most northerly bay that Ric had pointed us to; unfortunately we were unable to locate it. We then entered the Wapiskau River. This area is truly a jewel of Saskatchewan. It is comprised of many beautiful falls linking various small lakes in the classic “pool and drop” type of river system. If you are looking for a whitewater trip, you may be disappointed, as most of the marked rapids are falls; still there are a few that can be run, or lined. We camped at the base of the falls that enter White lake (location 051078). Because there are so many falls in quick succession, there are many portages. Most are quick carry-overs, but some require ferries across the mouth of the falls to landings on the opposite side. Care must be taken on some of the cary-overs that require you to land in moving water. Some of the cary overs are over sharp and very uneven stones. As well, the first of three portages into White lake is short but in rough condition; it is full of deadfall and I rolled my ankle on this portage. If you have planned a rest day, then take it on this section of the Wapiskau. The many falls are truly amazing. Other than a few sets of riffles (small boulder gardens), the only rapid we could run on day 3 was located at 948080 and there was barely enough water to run it (see pics). There is a rapid on the exit of white Lake/entrance of Steephill Lake that can be run. We shot this rapid with empty canoes numerous times as it was a fun and safe rapid to paddle. There is a tongue on the river left side that drops down a few feet and into some large standing waves (see pics). Also of note - once you round the two pronged peninsula on Steephill Lake and start paddling north on the Reindeer River, there is a distinct water colour change to a more aqua colour and the water is a lot colder. We paddled upstream on the Reindeer River from the south end of Royal Lake to an island campsite on Fafard Lake (location 167308). Although the current was stiff on the Reindeer river because of the Dam releasing a lot of water upstream, we had the wind at out backs and made good progress. *Stay to the river right side and paddle upstream, then ferry to the eddy behind the island dividing the rapids. *track your canoes up and around the rocks to the calm water above the rapids (if you don't want to track, you can carry the canoes over the rocks). This was a short but enjoyable day. The water coming out of Whitesand Dam was incredible. The portage is on the river left side of the Dam and is marked by a green sign. The water at the bas of the Dam leading to the portage is “funny water.” Waves are created and come at seemingly random intervals and from all directions. The portage is short and it was fun to spend some time checking out the Dam. We only had an hour paddle from our campsite to Southend. As you paddle into Southend (with Big Island to your right) just before the bridge, there is a dock on the left side where you can end the trip. We then loaded up and headed back to Saskatoon. *It can be comfortably paddled in 5 days (+2 travel days) even with VERY high water on the Reindeer (although a rest day to enjoy the Wapiskau is recommended). 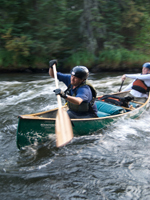 *We paddled this trip after having done the upper Clearwater in 2010, and the lower Clearwater/methye portage in 2011. This trip offered a very different experience. If you enjoy the intimacy of river travel you may be disappointed - but the beauty, solitude, fishing, and good road access, makes it a recommended trip. Last edited by Deebs on August 27th, 2012, 2:45 pm, edited 5 times in total. Nice report Deebs - hope to see a few more photos. I paddled that Wapiskau - Reindeer trip some years ago as part of a trip from Missinipe to Southend. I agree the Wapiskau is a really pretty little river, I wouldn't mind going back there some day. Great report D. I'm the beared guy who Does photo and video on our trips together. Will post some pics after the long weekend. Nice to see you on here Jeff! It would be great if you posted some more pics of the trip (and the videos of the Clearwater trips too). I'm sure other paddlers would love to see them. Thanks, you guys. Great pictures - they bring back lots of good memories.